Excludes critical system directories, that is necessary for the computer to operate properly. Usually it is not necessary to analyze the access rights of these directories. Excludes NTFS reparse points like directory junctions, symbolic links, etc. Usually it is not necessary to analyze the access rights of these directories, since they are redirect to other parts of the file system. Limits maximum directory depth level. Exclude specific directory path or directory name from audit results. Exclude account from audit results, if account is disabled. Exclude specific account from audit results. You have two options how to exclude directories from audit results - by directory path or by directory name. You can specify a directory path, which You want to exclude from audit results. If directory path contains any of exclude directory paths, it and all its subfolders will not be included in audit results. You can specify a directory name or part of it, which You want to exclude from audit results. If directory name contains this name, it and all its subfolders will be excluded from audit results. Enter account name which You want to exclude from audit results for example, CONTOSO\MikeKing. 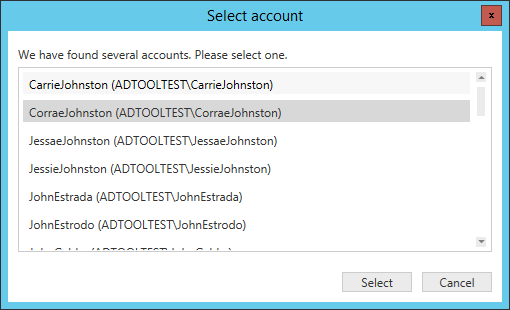 Or browse accounts in Active Directory. Choose domain from list of available domains. 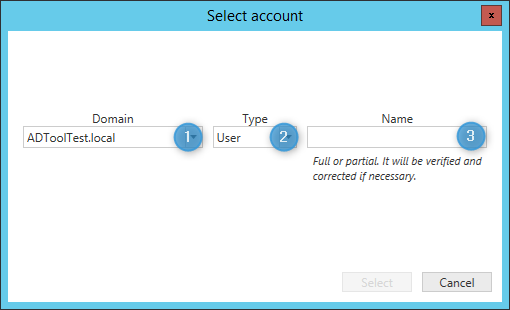 Choose account type - user, computer or group. Enter account name or part of it. Press select to verify this account. If one account will be found, then it will be selected, but if multiple accounts will be found - then You will be presented with account list to choose from.